"This recipe has been handed down from my mother. It is a family favorite and will not be replaced! (Definite husband pleaser!)" See how to make a rich and meaty pasta sauce. This recipe was very easy and tasty. It's a really hearty sauce and next time I'll add sauteed mushrooms. I'll certainly make it again!! 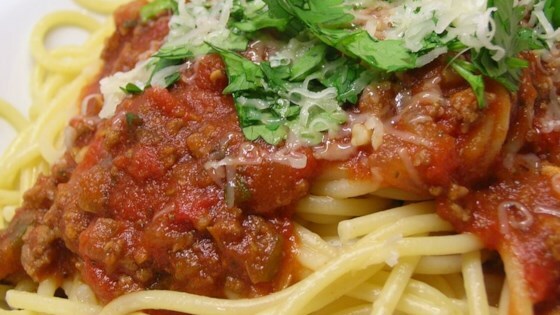 I absolutely loved this spaghetti sauce and so did my father and brother. I used "Italian Seasoning", but other than that, I didn't have to substitute anything.